As the largest professional healthcare workforce in the world, nurses are at the heart of unprecedented change and the importance of developing nurse leaders has never been greater. Of the unique challenges facing global leaders, the greatest is the need to develop leadership capacity and capability, and a leadership pipeline (Watson-Druée 2018). However, nurses do not always realise their ability to become global leaders, or know where or how to make global connections. In many organisations, not only those in the field of healthcare, more than four out of five chief executive officers rate leadership development programmes less than highly effective and less than one in 12 organisations are thought to have the best leadership development programmes for their staff (Salicru 2017). Recently, Rosser (2018) reinforced the importance of relationships in developing international partnerships. Yet the number of incidents in which patients’ lives have been threatened due to poor care care is increasing (Berwick et al 2018, Francis 2013). So how can the nursing workforce gain the skills required to become confident global leaders? There is a need to invest in nurse leadership to ensure the nursing workforce is equipped with the skills to deliver modern care, and with the connections to make it happen. Operating with strong results orientation. Nurse leaders will need education programmes to prepare them for their roles and continuous professional development to support them. But they will also need connections and collaborations of like-minded professional nurses to develop confidence in each of the four leadership behaviours identified above, which account for such leadership effectiveness. Additionally, nurse leaders need the vision to transform care so that it becomes ‘patient-centric, insight-driven, and value-focused’ (Deloitte 2018). Nurses need to understand the global problems facing healthcare, and have the insight to take risks and seek innovative solutions to address them. To do this, nurses need to reach out internationally, gain insight into what is happening more widely in the profession and share with others any innovation in the advancement of nursing care. There is much we can learn from and share with our colleagues across the globe. Embarking on their professional careers, nurses often lack confidence in their leadership abilities. Many are socialised early on into a hierarchy of command, and require continuous professional development to support them in their role. McKinsey and Company (2012) confirm the need to strengthen talent in organisations by helping staff to think differently, and by tailoring development programmes to meet the current and future needs of their organisations. 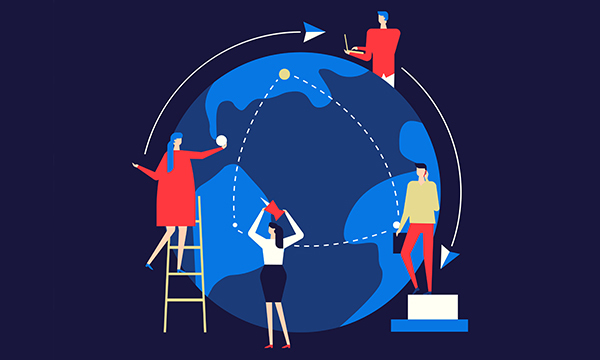 From a global perspective, McKinsey and Company (2012) try to widen potential leaders’ experience through bespoke secondments to develop specific skills. The global nursing organisation, Sigma, one of the largest nursing societies in the world with more than 135,000 active members, offers a way for nurses to reach out to, and network with, their peers around the world. The society focuses on developing leadership and scholarship for nursing practice, and assists nurse leaders around the world to develop their capacity and capability for leadership. It also supports nurses to find their voice and help ensure this voice is heard. In the UK, global societies such as Sigma have not traditionally been accessible to the novice practitioner, but opportunities to engage with colleagues around the world can now be realised. Given the magnitude and complexity of global healthcare, developing the capacity and capability of effective nurse leaders is vital to its successful delivery. While education is part of the solution, global collaboration can support transformational change.